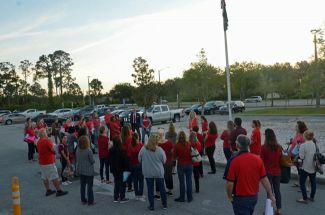 Florida teachers and unions filed a lawsuit Monday challenging the constitutionality of a new law that requires local unions to represent 50 percent or more of instructional personnel. Nearly one in five families have zero or negative net worth. That number rises to over a quarter of Latin American households and 30 percent of black households. The Florida Senate rejected a House proposal to dissolve teacher unions if membership falls below a certain point, but also approved a version of a school voucher program funding private school students. A three-judge panel of the 5th District Court of Appeal said the case is part of a broader dispute about demonstrations that the union has held against Wal-Mart in various parts of the country. The ruling stemmed from a case in which an attorney was awarded the equivalent of $1.53 an hour in successfully pursuing a claim for benefits for a worker injured in Miami. Even after a raise to $10 an hour, Disney employees can only expect to take home about $20,000 over the course of a year, not enough to live decently in Orlando. A $15-an-hour wage is more critical, argues Scott Klinger. The Palm Coast City Council sided with its Manager Jim Landon’s recommendation to reject union positions on a collective bargaining agreement in contention for three years. “Permatemping’ cases highlight a lack of U.S. protections for temp workers., who are exposed to more dangers in return for far less job protection or benefits. Other countries limit the length of temp jobs, guarantee equal pay and restrict dangerous work. The Florida Senate Commerce and Tourism Committee gave support to both proposals on Monday, even though a number of senators expressed concern about limiting an employer’s ability to use a credit history when judging a potential new hire for a non-financial or non-managerial role. The Coalition of Immokalee Workers has been trying for years to get Publix to join the Fair Food Coalition, in which suppliers and purchasers agree to pay the workers a penny more per pound of tomatoes picked. Publix won’t even meet with the workers. The proposed law, by Sen. David Simmons, is intended to thwart efforts to pass labor-friendly laws in local governments, since state-level labor reform is beyond reach with the anti-labor, GOP-led Florida Legislature. Inspired by Ronald Reagan’s union-busting, the latest round in the war on labor is a self-inflicted wound on the American economy, where workers-union and non-union alike–have been losing ground for 30 years. Reversing Florida’s recent population loss, there’s been an influx of undocumented workers moving to Florida from Alabama as a result of a newly passed state law, the harshest immigration enforcement measure in the country. The proposed law forbids union deductions from public employees’ paychecks, essentially gutting unions. It passed a committee, 11-9, with three Republicans breaking rank to oppose it. The Palm Coast city administration objected to lieutenants’ inclusion with rank-and-file firefighters in the collective bargaining unit. The state dismissed that objection, clearing the way for the unit’s formation. The hearing Friday will decide whether lieutenants and rank and file firefighters can form a single bargaining unit, which the city–which objects to unionization–is opposing. Some 75 percent of the Palm Coast Fire Department’s 60 rank-and-file employees voted to form a union. Higher pay or better benefits aren’t on the agenda. Job security is.